...So, what’s this book about? Elle Chambers is a respected freelance insurance investigator working in Edinburgh, Scotland who goes above and beyond to solve her cases while trying to keep everyone happy. Elle’s life is about to get completely turned upside-down when she accepts a job to find a missing piece of art. The blurb is a bit misleading though “Elle is a witch – and a damn good one, too” well Elle Chambers is an Enchantress (she can feel people’s emotions and project emotions onto others) and a “weak” one at that because her mother raised to believe that she must control her ability and protect herself completely from the onslaught of other people’s emotions or she’s go insane or die and all her life she’s been told by The Coven (the big organisation that governs all supernatural beings and makes sure that humans are kept in the dark about their existence) that enchanters are not as powerful as a witches. “Elle must first find a missing bad boy who might or might not be a werewolf” is also misleading as she’s already found the bad-boy werewolf, Ferguson Black, on the first page and he's a beleaguered lawyer who worries about his aging Mum, not very bad boy to me. Lol! This book is the first of “The Witch Detectives” series. 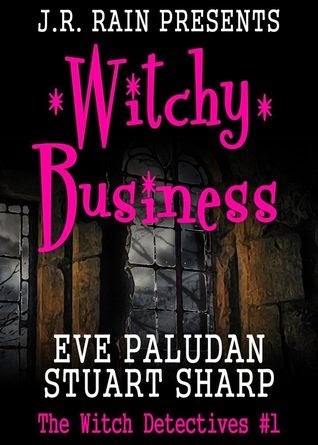 There are 3 books in the series at this time; “Witchy Business” (#1), “Witch and Famous” (#2) and “Witch Way Out” (#3). I really like the premise for this book, an enchantress/witch who investigated insurance claims; a young Miss Marple with added super natural abilities perhaps? Brilliant! I liked the main character and the fact that we got to experience the tale from her (1st person) perspective. Elle is an innately good person who doesn’t mind bending the rules slightly to ensure fairness. We get hints of all the skills (picking locks, computer hacking, etc) that she’s picked up over the years being an investigator and the good contacts that she’d made. I thought that the fight scene, near the end of the story was well written and kept me turning the pages, wondering how it would all end. What I also like is that although this is a beginning of a series, this book doesn’t have a big cliffhanger ending, which is fantastic for me (I hate that). I don’t think the authors have been writing for long, as I felt the writing style lacked “polish” and at times the turn of phrases used and story progression felt child-like/amateur, however, I do feel that this is something that usually improves over time with experience. This is a nice story. It is a journey of self discovery for the MC. It has romance, mystery, action and drama and it could work as a standalone novel as the ending isn’t a major cliffhanger.